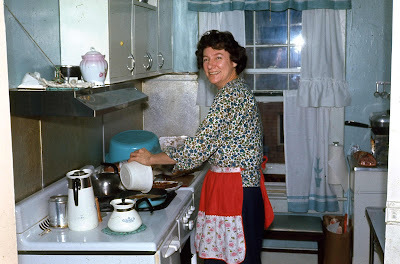 My mom cooking in our modest little kitchen in our house (built in 1910 in Arlington, VA). It's a nursery school now---Blue Bird Nursery---and painted Robin's Egg Blue. :) This photo must have been taken in 1965.
recently-passed Mother's Day to take time to salute my dear mom, Benny, who passed away last year. She was 95 years old. I'm still here in Northern Virginia, staying with my dear childhood friend Diane and husband Les in their lovely home in Vienna, Virginia (that's a suburb of Washington, DC, which was my old "hometown"). Diane and her sister Nancy and I grew up together across the street from each other in Arlington, Virginia----years ago. Both my mom Benny and Nancy/Diane's mom Olive were Single Divorced Working Moms in what was then an "Ozzie and Harriet" world. For those of you who are too young to know that Ozzie and Harriet was a family TV show in the 1950s, think of Richie's family in "Happy Days." My mom Benny and my friends' mom Olive both worked for the Federal Government as Civil Servants, secretaries to be exact, and they worked for over 30 years each. Single, divorced working moms did NOT have it easy in that world. They were actually considered Scarlet Women who couldn't "keep" their husbands. Hard to believe now, isn't it? But that was their world. My mom didn't marry again until much later in life after I was already married and raising a family. Mom married an old family friend who had lost his long-time wife to cancer the previous year. Since she knew what kind of wonderful man Stetson was, my mom Benny married and was finally able to enjoy the extra special things in Life like traveling to Europe and Hawaii and Canada and take cruises. I always told her she "deserved" it. She was a very special woman who worked very hard in her life and deserved to enjoy the fruits of her labors. She was a wonderful mother who loved me very, very much and adored her grandchildren. I was very lucky to have her. Happy Belated Mother's Day, Mom! Have any of you lost your mothers?